If you are anything like me, your smartphone works double or even triple duty serving as your camera, navigation system, schedule keeper and more -all on the go. It needs to keep up with my crazy busy life! 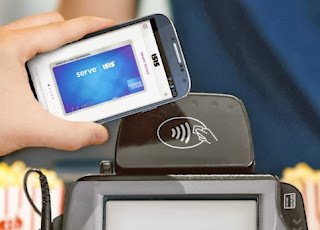 Well, your smartphone can now function like a digital mobile wallet with ISIS Mobile Wallet. You can safely and securely store your gift cards and so much more with ISIS. ISIS Mobile Wallet is way for you to access many items you already carry in your wallet digitally. Using ISIS Mobile Wallet is as simple as "tap to pay". I can think of several benefits to ISIS Mobile Wallet including staying on budget with Christmas purchases. ISIS also lets you add money straight from your bank. One of my pet peeves about gif t cards is never knowing my balance on each every card. Plus, you can save room in your wallet and purse -no more gift cards taking up space! You can add participating gift cards you get stratight to ISIS Mobile Wallet. And there are discounts and deals from participating merchants just for paying with ISIS. Adding cards is easy! Check out this quick video about how to add cards. A smartphone that uses the Android operating system (sorry, IPhone users) and supports Near Field Communication, or NFC (like the new LG G2 or Samsung Galaxy s4) and secure SIM capabilities. An enhanced SIM card from your provider. Once you have two two things, you just need to download the ISIS App from Google Play. PIN-Protected - YOur account is protected with a secure PIN number of your choosing. Secure Element - That enhanced SIM card you will be using works to protect the sensitive transaction data for each use. Protective ID -A unique transaction ID is sent with each payment transaction, making counterfeit use of your card more difficult. Personal Privacy - What you buy is between you and the merchants. So what do you think? Which feature of ISIS Wallet sounds the most intruiging? *Disclosure: This is a sponsored post. My opinions about the benefits of the product are my own.